March Madness is back again, and millions of brackets have been made. Last year’s champions, Villanova was defeated in dominant fashion by Purdue last Saturday 87 to 61. 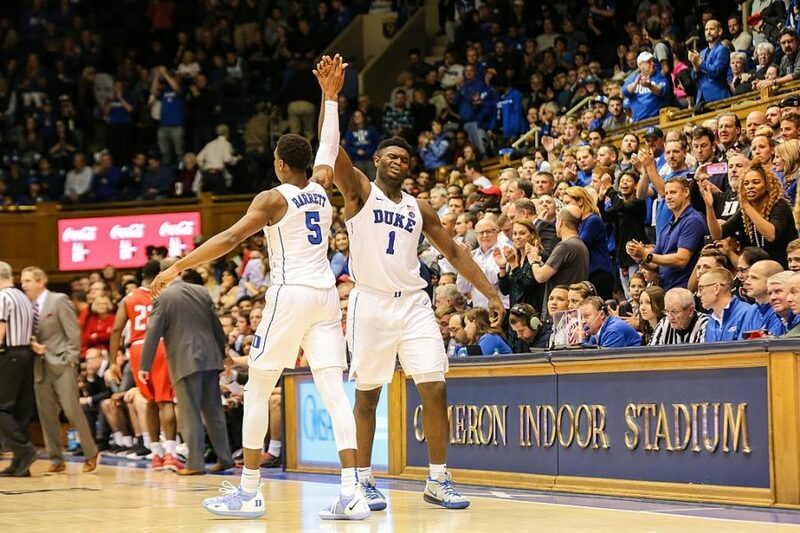 The Duke Blue Devils are the odds on favorite this March Madness due to their standout freshmen Zion Williamson, R.J. Barrett, Tre Jones, and Cameron Reddish. Duke has a long history of always having the best team entering the tournament but always seems to find a way out of the tournament. The Blue Devils won their last title back in 2015, giving Coach Krzyzewski, otherwise known as Coach K, his fifth title. Williamson, Barrett, Jones, and Reddish have taken the NCAA by storm. They were defeating every team that was put in front of them, and then they were met at a halt. Duke took on UNC for the first time in the most hyped up game of the season. The game, and more importantly Duke, took a huge hit within the first seconds of the game. Williamson underwent one of the most bizarre, infamous situations in sports history. Williamson had the ball in his hands and was in scoring position when his shoe exploded from underneath his feet. Williamson, who is a massive force at 280 lbs, broke through the stabilization of his shoe. 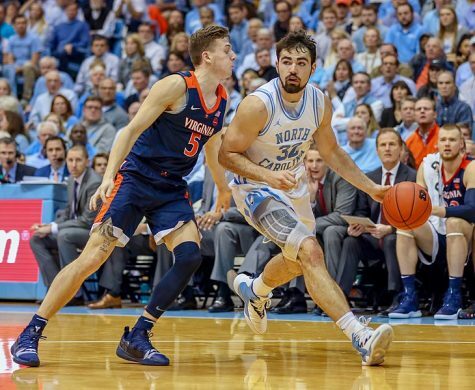 UNC’s Luke Maye (right) dribbles past UVA’s Kyle Guy in the first half of their game on Monday. Williamson cheated a career-changing injury with a mild knee injury and made his triumphant return in the Atlantic Coast Conference (ACC) Tournament where he did not miss a single shot in his first game back, and it appeared he never missed a step. Many other teams threaten the crown. Teams like UNC, Virginia, and Michigan who appeared in the National Championship last season lost to Villanova. UNC defeated Duke twice this season without the presence of Zion Williamson. UNC does indeed have a very talented roster with players like Luke Maye who has experience in the tournament when he hit a game-winner to send UNC to the Final Four two seasons ago. UNC also has a standout point guard, Coby White, who has speed like no other and can be passed a defender in a split second. Virginia has a chip on their shoulder this season as they make their return to the tournament after taking the most humiliating loss in NCAA history. It was the first time in history the lowest seed defeated the highest seed. UMBC defeated the Virginia Cavaliers in an upset victory which stunned millions across the nation and ruined tons of brackets. 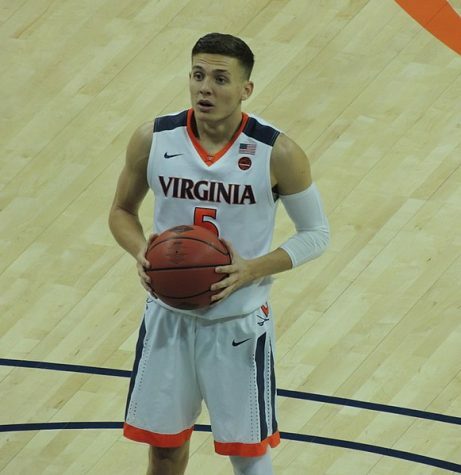 Kyle Guy prepares to take a free throw. The Cavaliers are ready to show what they are truly made of as they are really made of as players return like Kyle Guy and Jack Salt. They hope to get redemption for the embarrassing loss they suffered last season. Michigan also hopes to return to the national championship after making an appearance last season. Jordan Poole, who hit a game-winner in the tournament last season against Houston, is aiming at another strong tournament performance. Michigan will take a hit this season after losing Moritz Wagner to the NBA Draft. March Madness has never been simple and we are in store for another hectic ride as upsets are bound to happen and brackets will be ruined. Duke is my favorite due to their high power, action-packed freshmen.